So one of the places we hit on the way back from Canada was the United Airlines Flight 93 Memorial (Note, the use of the name United appears nowhere within the memorial). First, personally: I've always accepted the official story as truth, and I was deeply moved by my visit. It took a lot to hold back tears. That said, my visit brought more questions about the crash than it answered. While I don't want to buy into conspiracy theories, the one fact I can't get over is the F-16 that chased flight 93. Time Out's Chicken and Cheddar biscuit is one of the best things I've ever put in my mouth. Near the campus of UNC Chapel Hill resides the biggest and best biscuit I've ever eaten. It's an over-sized biscuit filled with a de-boned chicken breast. No I'm not talking about a chicken patty of processed white meat chicken, I'm talking about a honking huge piece of chicken breast covered in cheddar cheese on a huge multi-layer biscuit dripping in butter. 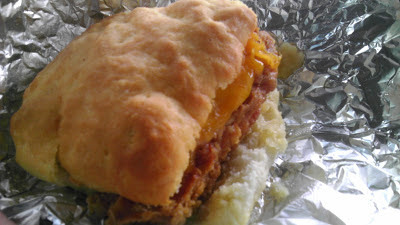 Where is this incredible breakfast biscuit? 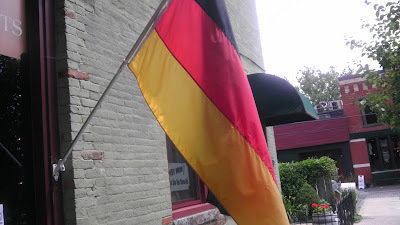 Time-Out Restaurant on Franklin Street in Chapel Hill. It's a rite of passage for students, a Tarheel favorite they claim.Walk in to the Carolina blue dining room and you'll be met by a sign that reads "Over 3.8 Million Sold". That's a lot of chicken and biscuits. If you believe marriage is one man and one woman.... You're wrong. If you are one of the many people who believe marriage is between one man and one woman, you're wrong. In fact Jesus who lived a celibate life embodied a life of no marriage at all rather than embracing the institution of it. To be a true follower of Jesus, to live as he did, might actually be to divorce your wife, and merely do good in this world. I realize this might be hard to hear, and you might think you can come up with some sort of logic, or bias against my own, but have you ever taken the a moment just to consider you're wrong? I know I've been wrong. Vinkensport - Sports I never knew existed before Belgium. 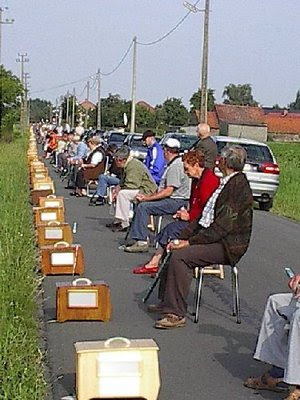 On a lonely road in rural Waregem Belgium sits a mile long row of competitors sitting on chairs with birds in boxes. Birds nicknamed from Rambo to Duracel, the goal is to count the "tweets" (susk-e-wiets) that the birds produce within an hour. The sounds are a unique noise which are tallied in chalk on long sticks, as the owners suspensefully sit on the edge of their seats waiting for the next chirp. Vinken Sport is a four hundred plus year old Dutch sport that boggles the western mindset who are more apt to turn the animals into the balls they play sports with than make a game with the animals (e.g. pigskins). There has been known issues with cheating, like the finch that turned out to be a endless-loop CD, or doping of the birds (seriously!!!). Move over Anderlecht soccer team, Vinkensport is a serious competitors sport. Let me disclose, that this list is distinctly from my perspective of living in the Triad of North Carolina. That said, the geography of these burgers spans from the Queen City to the Triangle, and represents some of the best burgers I've ever had. 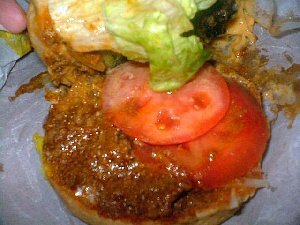 The following list of top 10 best burgers in NC is presented from best to good (1 to 10+). Enjoy! 1. Johnson's Drive In's Velveeta Cheese-Burger - Siler City, NC. No matter where I drive, and what I eat, Johnson's is still No. 1 in my book, with its thick slices of Velveeta on hand-picked fresh beef patties, and their chili is the undisputed winner of chili-cheese fries. Other burgers might come close, but you can't beat the quality of the beef at Johnson's that's butchered fresh straight from the stockyard.